A natural consequence is anything that happens naturally, with no adult interference. When you stand in the rain, you get wet. When you don’t eat, you get hungry. When you forget your coat, you get cold. No piggy backing allowed. Adults piggy back when they lecture, scold, say, "I told you so," or do anything that adds more blame, shame, or pain than the child might experience naturally from the experience. Children usually feel bad or guilty when they make a mistake. Piggy backing lessens the learning that can occur from experiencing a natural consequence because the child stops processing the experience and focuses on absorbing or defending against the blame, shame, and pain. 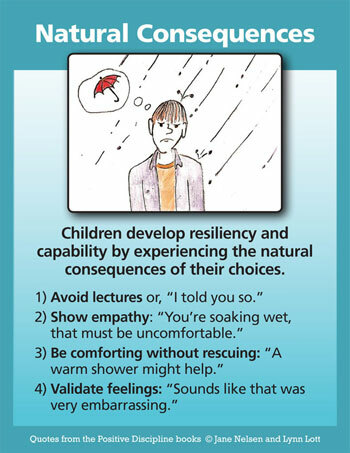 Instead of piggy backing, show empathy and understanding for what the child is experiencing: "I’ll bet it was hard to go hungry (get wet, get that bad grade, lose your bicycle)." When it seems appropriate, you could add, "I love you and have faith in you to handle this." It can be difficult for parents to be supportive without rescuing or overprotecting, but it is one of the most encouraging things you can do to help your children develop a sense of capability. Let’s look at an example of how natural consequences work. Billy, a first grader, forgot his lunch every day. Mother would interrupt her busy schedule to drive to school with his lunch. After learning about natural consequences, she decided that Billy might learn to remember his lunch if he experienced the natural consequence of forgetting. She first discussed this with Billy, letting him know she was confident that he could be responsible for remembering his lunch. She also told him she would no longer bring his lunch to school if he forgot it. It is very important and respectful to discuss, in advance, when you plan to change your behavior. Her intentions were sabotaged for a while because Billy’s teacher took over and loaned him money for lunch when he forgot. It was not until Mother and Billy’s teacher got together on a plan to allow Billy to learn from the natural consequences of his choices that his behavior changed. Billy tested the plan. The next time he forgot his lunch, he asked his teacher if he could borrow some lunch money. She said, "I’m sorry, Billy, but we agreed that you could handle your lunch problem by yourself." Billy then phoned his mother and demanded that she bring his lunch. Mom also kindly but firmly reminded him that he could handle the problem. Billy pouted for a while, even though one of his friends gave him half a sandwich. After that, Billy seldom forgot his lunch. When he did forget it, he managed to find someone who would share some food with him. By the time Billy reached the second grade, he added the responsibility of making his own lunch, as well as remembering to take it. Many adults don’t have much tolerance for the whining, pouting and disappointment. Billy’s mother did not find it easy to listen to her child be demanding, and it was difficult for her to allow him to experience being upset. She noticed some guilty feelings because he was hungry, but reminded herself that forgetting his lunch was really just a small mistake, one of many Billy would make in his lifetime. If she did not follow through on her plan, he would not be learning the life skill of getting a little more organized in the morning, and the good feelings of handling a problem himself. Instead he would be learning that whenever things didn’t work out for him, he could whine or complain and get someone else to take care of his problems. Looking at it that way, Mother was able to stay calmer. 1. When a child is in danger. Adults cannot allow a child to experience the natural consequences of playing in the street, for example. 2. When natural consequences interfere with the rights of others. Adults cannot allow the natural con- sequences of allowing a child to throw rocks at another person, for example. This is one reason why supervision is especially important with children under the age of four. The only way you can prevent potential dangerous situations for children this age is to supervise so you can rush in and prevent a dangerous occurrence. 3. When the results of children’s behavior do not seem like a problem to them and the natural consequences will adversely affect their health and well being. For example, it does not seem like a problem to some children if they don’t take a bath, don’t brush their teeth, don’t do their homework, or eat tons of junk food. What a very good and educational post. I found your site though a new friend, Kendra. I think your site is very well written and she spoke highly of you. As a single dad i try to blog about the struggles from not only a single parents view but also a guy's as well. I think your site will and has helped many readers. I am very glad i was referred over to you. I look forward to reading more. I hope even though I am newer at this you would call upon a single dad for his views sometime..
Good post. Everyone has to learn from their mistakes and as much as everyone hates consequences they are a necessary part of learning.